Acute Sinusitis: Sinuses become inflamed due to the action of bacteria, viruses or fungi. As the mucus starts collecting in the sinus, it causes congestion. There is also discomfort in cheeks, forehead and around eyes.It usually continues for 6-8 weeks. Chronic Sinusitis: When acute sinusitis persists for more than 8 weeks, it is known as chronic sinusitis. Also known as chronic rhinosinusitis it blocks drainage of mucus and causes it to accumulate in the sinus.It leads to swollen area around the eyes and makes your face tender to touch. Deviated Sputum: A deviated sputum is a condition in which the bone and cartilage that divide the nasal cavity of the nose in half is crooked. This misalignment can block the flow of air, thereby causing sinus problems. Hay Fever: Also known as allergic rhinitis, it can be caused due to irritants like cigarette smoke, perfume, dust, pollens and pet hair. It leads to collection of mucus, sneezing and itching as a result. Nasal Polyps: These are small growths in the nasal cavity that are caused due to inflammation of the sinus, resulting from asthma and nasal allergies. When they are small in size, they don’t cause any symptoms but the larger ones can block normal drainage, leading to a mucus build up.Too much mucus build up can cause sinus infection. Turbinate Hypertrophy: Turbinates are two spongy curled bones that protrude into the nasal passages. They enable proper airflow inside the nasal cavity. The ridges on the nasal septum become enlarged, which blocks airflow. 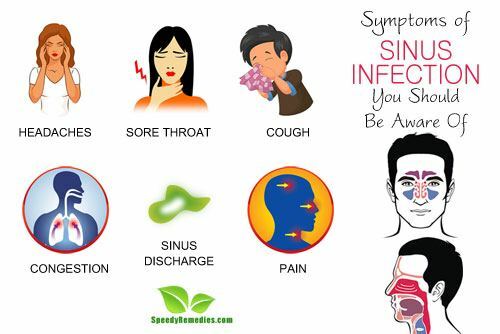 Sinus infections can sometimes be mistaken for a cold, and vice-versa, as they have similar symptoms. It is only through proper testing that it can be determined what the cause is. The constant pressure caused by the mucus build up and swelling in the sinuses can cause a sinus headache. Sinus headaches are different from normal headaches or migraines because the pain can get worse due to movement, especially when bending down. They can get worse after you get up from your sleep as laying down causes the mucus to accumulate. Sudden temperature changes can also worsen the headache. Swelling in the sinuses restricts the flow of mucus as well as air. The blocking of nasal passages makes you indifferent to taste or smell. Also, your voice sounds stuffy. Postnasal drip can make your throat ache. If your infection lasts for more than a few weeks, the mucus can irritate and inflame your throat as it drips, leading to a painful sore throat and hoarse voice. The discharge from the sinus can drain to the back of your throat, making it irritated. When this goes on for prolonged period of time, it can lead to a persisting cough. The cough gets worse when you lie down and immediately after you get up from sleep. When you blow your nose during a sinus infection (which is quite often), you will notice a greenish-yellow discharge from your nose. This discharge results from the infected sinuses and drains into your nasal passage. It can also drain into the back of your throat, which is what is commonly referred to as postnasal drip. This is the most common symptom of sinusitis. You might feel a throbbing pain behind your eyes, nose, forehead and jaw. Swelling in the sinuses leading to a mucus build up can also cause a dull and constant pressure in those areas. A simple sinus infection might lead to the doctor prescribing you a nasal decongestant. He/she might also ask you to use saline nasal washes. Do not use decongestants for more than 3 days, as it can worsen your sinus infection. You might also be prescribed anti-biotic if your infection is caused by bacteria. The course will probably go on for 10-14 days. If you sinus is caused by allergy, immunotherapy or allergy shots will be administered to help reduce body’s reaction to allergens. Persistent sinus infection that does not respond to treatments or becomes worse will have to be treated with a sinus surgery. It happens in very rare cases. Your doctor will talk you through the mode of treatment that is right for you, after he or she conducts the tests required. Sinuses affect close to 34 million Americans. It is a fairly common problem, and usually goes away after 5-6 days. If your symptoms persist, get a medical checkup done to get a clear idea about your condition.